With almost every country there is a food or a dish that we associate with that country or call it a national dish. Below we have compiled a list of five national dishes from five vastly different European countries that its citizens are proud to call their speciality, and a must try whenever visiting one of these countries as a tourist. Who has never heard of Swedish meatballs? A popular dish throughout Sweden, and now available around the world, thanks to the Swedish furniture giant IKEA. If you do not want to make them at home just visit the huge blue store with the yellow writing where they have Swedish meatball available every day in their restaurant. If you would like to make them at home here is celebrity chef Jamie Oliver’s recipe for Swedish Meatballs. The perfect Sunday lunch does not get any better than Roast beef, and Yorkshire pudding, and if you ask any Englishman to describe what England’s national dish is, this is the answer you will get. Making this dish requires a fair bit of preparation, and is only really suitable for a family, but if you happen to be in England for the Olympics pop into a local pub or carvery, and you are sure to find Roast beef and Yorkshire pudding on the Sunday lunch menu. Here is cooking Diva Nigella Lawson’s recipe for this English favourite Roast Beef & Yorkshire Puddings. 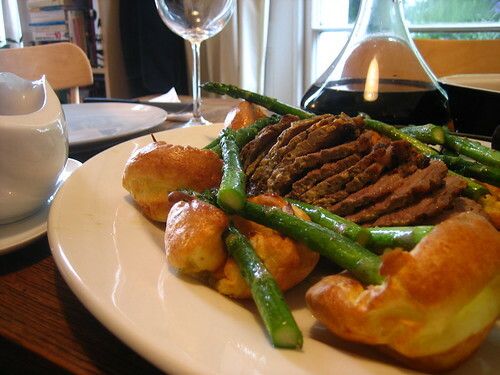 Traditional English Roast Beef and Yorkshire Pudding. France is known world-wide for its culinary delights, and yet when we think of a national dish there are so many to choose from, so we went for a warming winter casserole of Coq au vin which is chicken slow cooked in red wine with carrots, and mushrooms which together with a crusty baguette, and a nice glass of Cote du Rhône is just heaven. For an Authentic recipe try this recipe for Coq au Vin from Julia Child. Hungary like France is known for its cooking and whenever we are in Budapest there is only one thing we want, and that is Hungarian Goulash tender chunks of beef cooked in a sweet paprika sauce with caraway seeds served with bread dumplings for soaking up the sauce. A one pot dish perfect for that slow cooker that, that you can let simmer for hours. Here is a great recipe for Hungarian Goulash from the food network. When you think of Spain the first thing that comes to mind is Sun, Fun, Paella, and maybe Sangria. The original Paella still found in inland parts of Valencia province is a rice dish made using Rabbit. Over the years the dish has been adapted for tourists using, if near the coast seafood, and chicken. Again another one pot dish, and so easy to make with the only secret being you must use rice from Spain, with the brand name “Bomba” being the best one. If you cannot find authentic Spanish rice the Italian Arborio rice used for Risotto’s is a good substitute. Here is celebrity chef Mario Batelli’s Paella recipe.